In the first post in this series, we looked at the definition of social entrepreneurship. In the second post in this series, we looked at the definition of externalities. In today’s post, we’ll look at some solutions to externalities. There are a number of different ways to solve the problem of externalities. More generally speaking, these different ways of solving the problem of externalities fall into one of two categories: public or private. Under the category of public solutions to externalities, we have things like government provisions, subsidies, or Pigovian taxes. Pigovian taxes (the name comes from Pigou) are those taxes that are intended to influence a party away (disincentivize) from creating the negative externality. One kind of Pigovian tax is a ‘sin tax,’ which are those taxes that are applied to things like alcohol and tobacco. 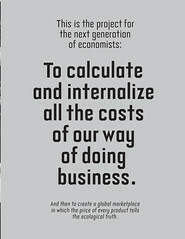 One of the main arguments for allowing for private sector solutions to externalities is internalization. What is meant by internalization? Consider an example where a fisherman owns a river and a steel plant pollutes the river. The fisherman would demand that the steel plant cease polluting because the fisherman had property rights of the river. The fisherman internalizes the externality of pollution because the fisherman owns the river. The pollution is not an externality to the fisherman; it is a very real and present part of the equation. One of the problems with a solution like this is when the problem is scaled up. Consider the Atlantic Ocean. Who owns it? While property rights may work for some situations, it is most definitely not a viable solution to all issues involving externalities. Recently, there was a very interesting proposal put forth that, “externalities seem destined to rattle forth from the grave.” In other words, these authors felt that ‘externalities’ was no longer a relevant term in the lexicon nor as a concept to study. Instead, these authors feel that, “externalities do not differ in any substantive way from any other kind of inefficiency.” The argument is quite compelling. They cite two main axioms regarding inefficiencies, “(1) All inefficiencies, including Pareto relevant externalities, represent unexploited gains from trade and (2) When free exchange is allowed and transactions are costless, all Pareto relevant inefficiencies will be negotiated away.” When the argument is phrased in this way, it is hard to disagree. The authors are trumpeting the horns of the free market. In the concluding remarks by the authors, they make it clear that the aim of their article was to highlight the number of policies passed in the name of externalities. To their credit, they are absolutely right. There are a number of laws and regulations put into place in the name of externalities. Now that we have discussed some of the general theories regarding the solutions to externalities, we can dive deeper into the discussion around externalities and social entrepreneurship. Specifically, we can begin to answer some questions about the cross-section of the two concepts. This entry was posted in Business, Education, History and tagged Externalities, Externality, George Mason University, Pigou, Pigovian tax, Private, Public, Sin tax, SocEnt, Social Entrepreneurship. Bookmark the permalink. Very good site you’ve got here.